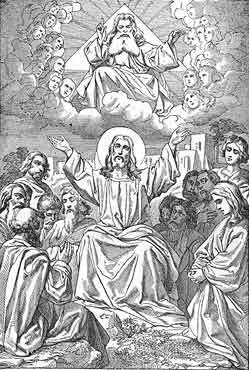 INTROIT Sing ye to the Lord a new canticle alleluia; because the Lord hath done wonderful things, alleluia; he hath revealed his justice in the sight of the Gentiles. Alleluia, alleluia, alleluia. His right hand hath wrought for him salvation; and his arm is holy. (Ps. XCII.) Glory etc. COLLECT O God, who makest the minds of the faithful to be of one will: grant unto Thy people to love what Thou commandest, and to desire what thou dost promise; that amidst the various changes of the world our hearts may there be fixed where true joys abide. Through etc. EPISTLE (James I. 17‑21.) Dearly beloved, Every best gift, and every perfect gift, is from above, coming down from the Father of lights, with whom there is no change, nor shadow of alteration. For of his own will hath he begotten us by the word of truth, that we might be some beginning of his creatures. You know, my dearest brethren. And let every man be swift to hear, but slow to speak, and slow to anger: for the anger of man worketh not the justice of God. Wherefore, casting away all uncleanness, and abundance of naughtiness, with meekness receive the ingrafted word, which is able to save your souls. ASPIRATION Aid me, O Lord, to preserve the dignity received in baptism, grant me a great love for Thy divine word, and strengthen me to subdue my tongue and to use it only for Thy glory. GOSPEL (John XVI. 5‑14.) At that time, Jesus said to his disciples: I go to him that sent me: and none of you asketh me: Whither goest thou? But because I have spoken these things to you, sorrow hath filled your heart. But I tell you the truth: it is expedient to you that I go; for if I go not, the Paraclete will not come to you: but if I go, I will send him to you. And when he is come, he will convince the world of sin, and of justice, and of judgment. Of sin, because they believed not in me: and of justice, because I go to the Father, and you shall see me no longer: and of judgment, because the prince of this world is already judged. I have yet many things to say to you, but you cannot bear them now. But when he, the, Spirit of truth, is come, he will teach you all truth; for he shall not speak of himself; but what things soever he shall hear, he shall speak, and the things that are to come he shall show you. He shall glorify me, because he shall receive of mine, and shall show it to you. INSTRUCTION As the disciples, in their grief at Christ's going to His passion and death, after the accomplishment of which He was to return to His Father, never once asked Him: "Whither goest Thou?" many Christians, because of their attachment to this world and its pleasures, never ask themselves: Whither am I going, whither leads my way? By my sinful life I am perhaps going towards hell, or will my little fervor for the right, my lukewarm prayers take me to heaven? Ark yourself in all earnestness, dear Christian, whither leads the way you are going? Is it the right path? if not, retrace your steps, and follow Jesus who by suffering and death entered heaven. Why could the Paraclete not come before the Ascension of Christ? Because the work of Redemption had first to be completed, Christ had to die, reconcile man to God, and enter into His glory, before the Spirit of truth and filial adoption could abide in man in the fulness of grace. From this we may learn that we must purify our hearts, and be reconciled to God, if we wish to receive the gifts of the Holy Ghost. How will the Holy Ghost convince the world of sin, of justice and of judgment? He will convince the world, that is, the Jews and Gentiles, of sin, by showing them through the preaching, the sanctity and the miracles of the apostles, as well as by gradual inward enlightenment, the grievous sins which they have committed by their infidelity and their vices; of justice, by unveiling their error, and showing them that Christ whom they unjustly rejected, is the fountain of justice; of judgment, by showing them their condemnation in their prince and head, the devil, whom they served. This prince is now driven from idols and from the bodies of men, and his kingdom is destroyed in the name of Jesus by the apostles. Why did not Christ tell His apostles all He had to tell them? Because they could not yet comprehend, and keep it in their memory; because they were still too weak, and too much attached to Jewish customs, and also because they were depressed; He. therefore promised them the Holy Ghost, who would fit them for it by His enlightenment, and would teach them all truth. How does the Holy Ghost teach all truth? By guiding the Church, that is, its infallible administration, by His light to the knowledge of the truth necessary for the salvation of souls, preserving it from error; and by advancing those members of the Church who seek His light and place no obstacle in its way, in the necessary knowledge of truth. What is meant by: He shall not speak of himself, but what things soevey he shall hear, he shall speak? That the Holy Ghost will teach us only that which He has heard from all eternity from the Father and Son; His teaching will, therefore, perfectly agree with Christ's teachings, for the Holy Ghost proceeds from the Father and Son and is equal God to them, and that which He teaches is also their doctrine, which is expressed in the words: He shall receive of mine. ASPIRATION Ah, my Lord and my God! direct my feet in the way of Thy commandments and preserve my heart pure from sin, that T oly Spirit may find nothing in me deserving of reproach, that He . may teach me all truth, and lead me to Thee, the eternal Truth, in heaven. Amen.